New Pixar Movie Snags Tom Holland, Chris Pratt, and Julia Louis-DreyfusA pair of teen elves set out to find magic. Pete Docter, Jennifer Lee Will Replace John Lasseter at Pixar, Disney AnimationLasseter went on leave from his roles at Disney and Pixar last year following misconduct allegations. Which New Superhero in Incredibles 2 Is Best?Incredibles 2 presents a fresh, illustrious group of minor characters. Let’s rank them. Pixar Head John Lasseter to Leave Disney at the End of the YearAdmitting to “missteps,” Lasseter went on a six-month sabbatical in November following complaints of inappropriate workplace behavior. Incredibles 2 Trailer: Nobody Puts Baby Jack-Jack in a CornerThe super family is finally getting their sequel. See Bob Odenkirk, Catherine Keener, and More in New Incredibles 2 ArtPixar has just released illustrations for the new Incredibles 2 characters. Disney Execs Reportedly Worked Around John Lasseter’s Inappropriate Behavior“He was inappropriate with the fairies,” a former executive said, referring to the young actresses hired to play Tinker Bell characters. Accounts of Misconduct Surface After John Lasseter Announces ‘Sabbatical’Several news outlets are publishing reports of inappropriate behavior by the head of Disney and Pixar animation. A New Superhero Is Born in the First Trailer for Incredibles 2Somebody cute is getting their powers. Toy Story Writer Claims Very Depressing Rumor About Andy’s Dad Is ‘Fake News’“Complete and utter fake news,” Andrew Stanton claims. Um Pixar? This Cars 3 Trailer Isn’t Kid-FriendlyIn which we stress out our children, so we don’t have to be alone in our existential dread. 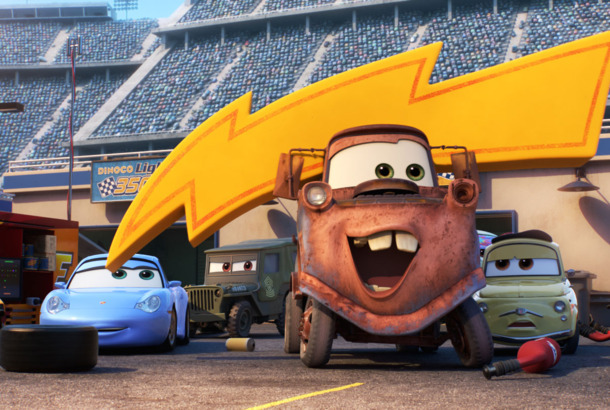 The New Cars 3 Teaser Keeps Things Just So WeirdAre we supposed to find the cars … hot? Alec Baldwin Is Tiny Trump in Boss Baby TrailerWhat to Expect When You’re Expecting the Donald. Why Are Finding Nemo and Finding Dory Such Enormous Hits?They’re Pixar’s biggest successes, but why? Piper Teaser: Pixar’s New Short Is Overwhelmingly CuteLike it or not, you’re about to say, Aw. The Secret Number That’s in Cartoons EverywhereA113. Bill Hader and Kate McKinnon Join Finding DoryPixar announced the film’s full cast on Wednesday. Zootopia, Pixar, and the Animation LandscapeAnd don’t forget the ever-prolific DreamWorks. How ‘Sanjay’s Super Team,’ Pixar’s First Indian-Themed Short, Was BornWriter-director Sanjay Patel’s dad had to convince him to make it. See the Exclusive Poster for Pixar’s New Short, The Blue UmbrellaUmbrellas falling in love! Watch an Astounding Clip From Pixar’s Next ShortWOW. See Concept Art for Pixar’s Next Four MoviesNot surprisingly, they all look great. The Pixar Lamp Is Alive and Well, and Also Real!Just try to look at Pinokio and not think of Pixar. Pixar Hands Film to Safety Not Guaranteed WriterDerek Connolly and Teddy Newton. Watch Partysaurus Rex, a New Pixar ShortYou can’t go wrong with Wallace Shawn. Watch a Clip From Pixar’s Partysaurus RexWallace Shawn: still at it! See a Pixar-Themed AlphabetWe want a print! Andrew Stanton to Direct Finding Nemo SequelIn return, the John Carter helmer hopes to make another live-action movie. See What It Would Look Like If Pixar Made a Justice League MovieIs it us, or are Superman’s thighs way too skinny?